Happy New Year, Twisters! Yeah, about that break I was going to take this week…… I just couldn’t stay away! And I have a break coming up in mid to late January because of some cross over episodes with other podcasters and interviews I’m hosting so I couldn’t skip a week now when I’ll have to skip one later this month. So what are we talking about today? 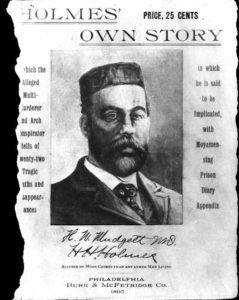 I want to tell you the story of an infamous serial killer, probably one of the most notorious and prolific serial killers in American history. No, I’m not talking about Gary Heidnick. I told you I don’t want to talk about him yet. I want to tell you the story of H.H. Holmes. Now you’re probably thinking WTF? He’s not a Philly serial killer. Maybe not, but there is a significant Philadelphia connection, in fact it was a crime he committed right here in TwistedPhilly that stopped his reign of terror, scams and bigamy. 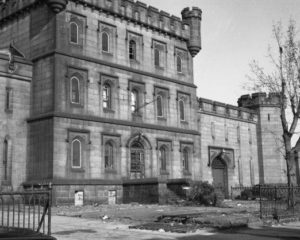 And it was in Philadelphia where he spent the last year of his life, incarcerated at the old Moyamensing Prison. It was here in Philadelphia where he stood on the scaffolding and spoke his last words before a noose slipped around his neck. And it was here in Philadelphia where suspicious deaths surrounded many of the players associated with Holmes and his trial for almost 20 years. This is a history lesson about the life and eventual death of H.H. Holmes which you may not yet have heard. And you know me, I love taking a walk down the twisted path of history, especially when we’re walking those streets in Philadelphia. Follow TwistedPhilly on social media: Twitter @Twisted_Philly, Facebook TwistedPhilly Podcast or our member group TwistedPhilly Discussion Group.